Should You Breakup with Startups? In a way startups are like the bad boys[or girls] in your dating repertoire. They are exciting, risky and non-committal. They take you places you’ve never been before–offering you the illusion of riding off into the sunset in your very own Tesla. When the reality is you are more likely to be shutting off the lights and riding out the door in your office chair. Startups have been breaking my heart for over 15 years. The first was BlindGift. Gifts for the blind, not quite, it was a way to send gifts to people you met online without knowing their physical address. Interesting idea, just ahead of its time. It rolled along, but I left before the acquisition happened and my stock grant went into the pile of worthless souvenirs. About the same time, I finished my MBA at Santa Clara with some folks who were trying to change the way personal investors could access stocks. If you think it is hard now for women to get funding, back then it was almost unheard of. Then I tried a startup within a larger company. Less risk, more resources and still the same amount of innovation. What’s not to like about that? Well, large companies often have less tolerance for margin draining ventures and suddenly you are handcuffed with big company process and no big company dollars. Digital writing– it was a nice idea. At least I got a Demo God award out of it, and a lovely dinner with our CEO for coming home with it. It was at that point I decided to opt for big company stability for awhile, but with it, more bureaucracy than I ever could have imagined, even in a young and growing division. Note I didn’t learn the lesson from the previous years–a comfortable boyfriend may not be the one that ignites your passion. 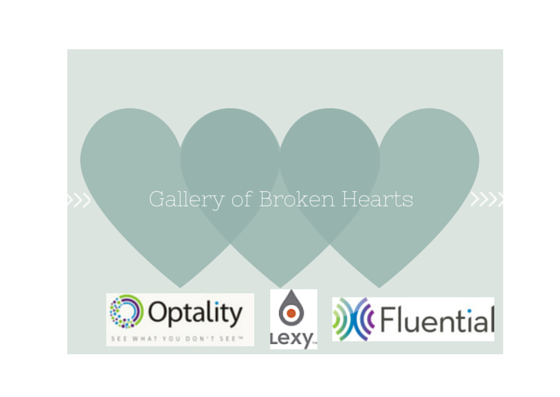 Fast forward through three more startups, each more successful than the last [Lexy, Optality, Fluential…if you are keeping track]. The last one was the classic on and off relationship–one day you have money and the next day your burn rate is more than you expected and you find yourself with some extra weeks of vacation. The promise of the future keeps you hanging on, being able to help others live a better life, but at the end of the day, technology is always valued more than marketing by the engineers and scientists. Throughout most of these adventures I’ve been fortunate to have a partner who had a stable job with benefits, making it easier to ride out the lean times. So, what next? Do I stay in Startupland or go back to the Big Leagues? These are the three questions I am asking myself. How much do I like the ambiguity of roles? Sure, you may have a job description when you were hired, but there are several roles in your organization which no one has thought about yet. How much do you enjoy being IT, marketing and legal in any given day? When there’s less than 20 people in the office, don’t be surprised if you are figuring out how to connect your laptop to wireless printer or negotiating a vendor agreement as part of your normal work day. You have to feel comfortable with fluidity and filling in roles until the organization is ready to have them. Am I okay with just getting good experience? I’ve never done a startup with any intention of becoming rich. Despite the many Silicon Valley success stories, there are probably close to a million failures–and now, vacant domains. If you want annual bonuses and some guarantees that you can put some money in a retirement plan, then early stage startups are probably not the place for you. Is work a passion for you? Even in the most “balanced” of startups [they do exist, especially in the health and wellness arena], you want to check your email on weekends. You are excited by the launch and are willing to put the hours into making it happen. This last one is the key area for me. I love bringing new ideas to market. I’ve worked on some amazing technologies and maybe they weren’t the right idea at the right time, but every time I believed that someone’s life would be better if we brought it to market. So, what next? Like the men who have been in my life, I believe that each company and job bring you the knowledge you need at the right time. What’s most important to me is who I’m working with, doesn’t matter if it is small or big. I want to have success with a team I enjoy spending every single work day with. What about you? Are you the startup type?